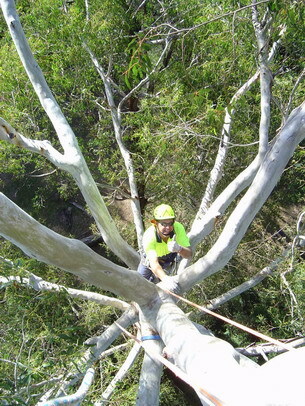 Treetec provides arboricultual related training in South Eastern Australia, primarily Melbourne Victoria. Treetec can design a course to suit a need, we have worked with a range of clients from Koala and Falcon researches designing tree access methods through to Police Search and Rescue for Felling and Canopy Access. Treetec also provides training for the management of tree related risk and can advise on how to manage issues around compliance and risk mitigation requirements within budget constraints. Treetec provides tree risk assessment services as well as training to council staff and land managers so that field staff within those organisations can monitor and manage tree related risk. Using a combination of external experts, and trained internal staff greatly reduces the costs around tree risk management. Treetec’s introductory course for on the ground workers trains participants to identify hazards and risk associated with trees and how to manage that risk. The course is based on the national unit of competency: ‘Assess trees’ (National code – AHCARB501A). The course is divided between in-field, practical skills development and theory components. The focus is identifying likely problems and how to manage tree related risk in both the short and longer term. This course is based on the full unit of competency: ‘Assess Trees’ however does not include the extended report writing and testing of the full unit. Upon completion participants should be able to identify most readily observable tree hazards, estimate the level of risk and have a good idea of the appropriate management options. Also participants should understand that some hazards will not be obvious and in any given tree population there may be a necessity for inspection by more experienced / qualified personnel or with the use of diagnostic equipment. Course duration and cost is dependent on the number of participants and location. For councils or community groups installing nest boxes or glider or bat or possum boxes we have devised simple safe ways of getting into and out of the tree as well as managing systems to ensure emergeny procedures are covered. Working solely off ladders can be dangerous and limits both height and manouvarability. We can demonstrate and train how to apply some simple, cost effective options to get safely into a tree and, move around allowing appropriate siting, height and aspect for nest boxes. It is easier to train a camera operator to climb a tree or assist them into a tree than train an arborist to use a camera. Canopy access can be safe, efficient and cost effective with the right gear, supervision and training. Whatever sort of hardware or installation is required or positioning of people above ground, we can help devise effective and safe ways of accessing trees and working in the canopy. Decorative installations such as Christmas lights often need to be installed at the extremities of limbs and along lateral branches, Treetec can provide installation and maintenance options that are safe, don't adversely impact the trees and cost effective. It can be straightforward to get non climbing personnell such as students or researches safely into (and out again) a tree canopy. It can be done with little effort on the part of that person. This is also true for equipment that may need to be hoisted to the canopy top. The challeges of climbing and working with trees, particularly large trees, make it ideal for team building exercises and developing self confidence within 'at risk' youth. Contact us to discuss tailored programs and opportunites to take people out of thier usual urban environment and experience something unique. Specialist groups such as these will appreciate training that caters to thier specific work place challeges, it may be how to lower a paraglider pilot from the tree canopy, rig a fallen tree from a building or how to remove very large timber from fire trails in back country areas. All workplaces come under the OHS Act, we can incorporate manageable OHS systems into any course, meaning you can keep everybody safe and have documentation to show that appropriate training has been undertaken. If requested we can work with your team to prepare policies and procedures that not only maintain safety and avoid incidents but ensure you always have the right documentation in place. Canning's is offering a discount to Treetec students.